In order to achieve efficient low energy solutions, the jet air width, velocity and pattern of the airflow is crucial. Airbloc units incorporate the following design features for optimum performance include uniform linear flow across the full door width and fan speed control. Installation considerations; the air curtain should be situated as close to the open door as possible. The selected air curtain should be marginally wider than the opening and the air curtain should be commissioned to ensure the most efficient fan and heat settings are selected. The new range of air curtains is even more energy efficient and easier to service/install whilst giving a higher performance. It features a completely new design using EC fans instead of tangential wheels for a higher low energy performance. Air curtains reduce heat and cooling costs by providing an air barrier to keep cold or warm air in or out as required. When doors are opened in heated buildings, outside, colder, more dense air flows in through the bottom half of the door opening, whilst warm internal air flows out through the upper part of the doorway. Conversely, in air-conditioned buildings or cold stores the colder more dense internal air spills out at low level and is replaced by warm moist air. The installation of an Airbloc energy saving air curtain provides a barrier of air that defects the natural convection airflow keeping conditioned air inside the building. The Airbloc design provides air at a critical velocity, volume flow and temperature for optimum performance. Airbloc curtains may be mounted horizontally or vertically to suit the space and structure. 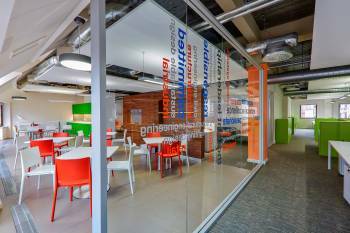 The old range of air curtains was able to offer 65% of air uniformity and the new version will now offer 85% which meets the new FETA approved standards. 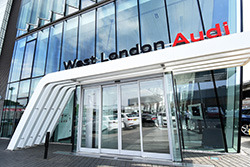 The new range of vertical air curtains has recently been installed at West London Audi, a prestigious five-storey car dealership situated on the Great West Road, close to the M4/A4 intersection, which is the brand’s premier showroom in Europe. The landmark building is highly visible when entering London from either approach, but the entrance is exposed and every time the doors are opened cold draughts sweep in and heated/conditioned air escapes. Airbloc provided a powerful and highly effective solution to ensure a warm welcome for customers and comfortable working conditions for staff. It supplied an air curtain from its new ACV architectural range. 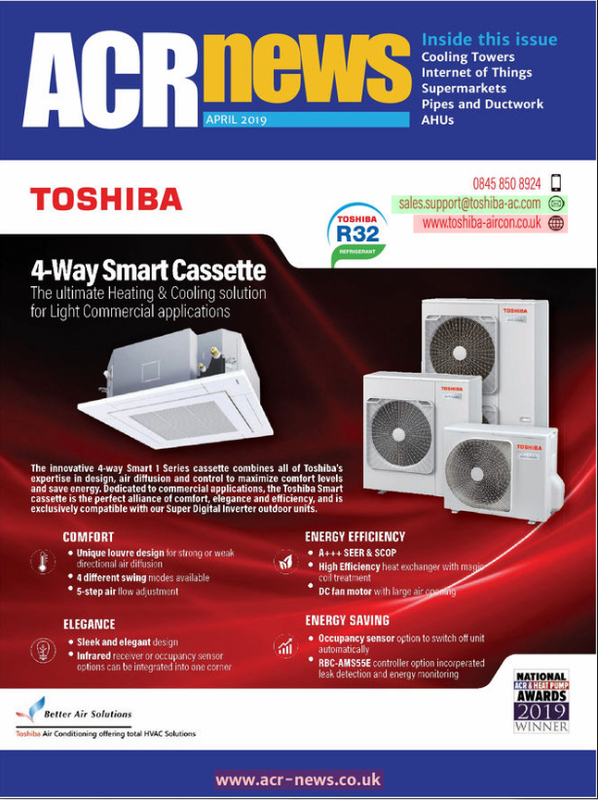 Complementing the well-established wall-mounted AC series, ACV units are purpose-designed for applications where the aesthetic appearance of the system is as important as functionality and/or space above the door is limited. Since the dealership’s double sliding entrance doors provide the only vehicular access to the building, they hinge forwards to maximise the available space. Cars for the showroom display are moved into place using a lift, while customers move around the building via escalators positioned around the lift shaft. Escalators are prone to scooping up and channelling cold air currents, which then cascade down through the space. The resulting cold draughts make for uncomfortable conditions that are likely to have an adverse impact on the customer experience. ACV air curtains are designed for entrance doors of up to 3m in height. With a heating capacity of up to 34.6kW, the unit selected delivers a powerful airflow – yet is quiet to operate. As a result, the ACV range is well-suited to exclusive shops, headquarters office buildings, hotel lobbies, golf clubs, conference centres and large glass-fronted structures like the Audi dealership. The best results are achieved by mounting air curtains vertically and as close as possible to the door, although the ACV unit can also be installed horizontally for added flexibility. At West London Audi, Airbloc worked with M&E contractor Hendry Electrical of Grimsby to provide a minimalist, and highly stylish solution. The ACV2500SE20 unit was mounted vertically at the side of the entrance doors and, because it is self-supporting, there was no requirement for extra steelwork or brackets. Adjustable feet help to compensate for uneven surfaces to ensure a neat installation. All three models in the Airbloc ACV range come with a choice of either ambient, three phase electric or low pressure hot water (LPHW) connections, which can be through the top or bottom for a clean professional finish. The air curtain is operated via a wall programmer, which incorporates thermostat/time functions and, in advanced mode, can be controlled over a MODBUS protocol link. For a prestigious building such as the Audi dealership, which relies heavily on ‘kerb appeal’, it was essential that the air curtain did not detract from its surroundings. ACV units are supplied in polished, mirror-polished and brushed stainless steel with a black intake/outlet grille as standard, but Audi commissioned a customised finish in silver (RAL9006) to colour match the dealership’s glazed entrance lobby. Stuart Godfrey, project manager at Hendry Electrical, said: “Thanks to Airbloc’s ACV air curtain, cold draughts no longer cascade throughout the entrance area. Conditioned air is effectively sealed in, and with both modulating heat and five fan speeds the unit automatically compares the exterior temperature to that inside the dealership to maintain the required internal set point.